I love cycling, I really do. Sportives are a bit of an addiction for me, and the more I can do, the better. 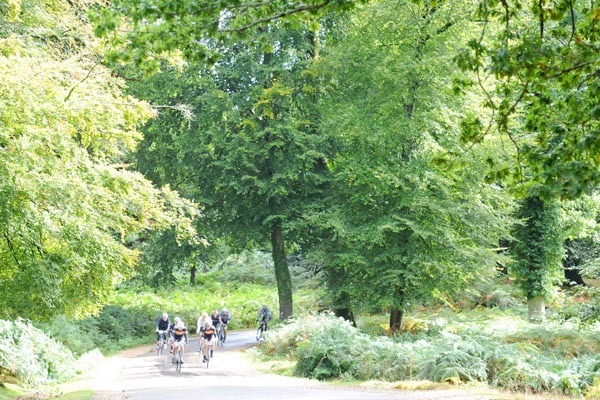 So signing up for two medium-length sportives over three days is my idea of heaven. There were some familiar faces, both regulars of Wiggle Rides and event staff, as the hundreds of guests patiently parked and signed in. There were even bacon baps for those whose dietary lifestyle permitted it. It was evident also that riders from other concessions were signing in, including a team from Factor Bikes who were showcasing their flagship Vis Vires — they certainly had a lot of attention from many who had probably already maxed out their credit cards on the kit they were riding that day. Before the start of the ride there was going to be a Q&A session from the Garmin pro riders on the course that day — big, big names including Liège-Baston-Liège and GT Stage winner Dan Martin and Jack Bauer (who looks nothing like Donald Sutherland in the flesh). The Q&A dragged as the noise of persistent rain hammered down on the marquee, delaying our start but not dampening the enthusiasm. Thirty minutes later I was queued up with a plethora of carbon and electronic wizardry approaching the bunch start, a slippery and potentially ruinous up ramp out of the event centre. Thankfully, nobody in my group had a clip-in failure and we all headed out into the drizzly New Forest morning. I’ve cycled the New Forest many times and it has some of my favourite roads. I particularly enjoy the section through Rheinfield Ornamental Drive, but once clear of that, the roads are more exposed and the wind became a major factor. Ploughing into what felt like a constant headwind did nothing to prepare riders for the main challenge of the day, the 25 per cent shock of Blissford Hill. By the time I reached the bottom, the rain had long gone but my rain cape hadn’t and I was roasting in the meagre autumnal sun. I reckon I must’ve been doing well enough as I’d not noticed being passed by any pro riders, although the Tron-like trio of Factor Vis Vires riders seemed to glitch back and forth in my field of vision, the explanation for their tardiness explained in the closing kilometres by seeing them once more at the road side changing lightweight, super bright latex tubes that had suffered in the soggy conditions. The only thing that slowed me down, apart from the obvious lack of ability, was a Mexican stand-off between me and a particularly bold Gloucester Old Spot that turned sideways and moved into my path which ever way I chose to proceed. Luckily the debris under my brake blocks caused a squeal which must have startled the beast and he backed off before any outside arbitration was needed. Perhaps he was upset about my choice of breakfast. The final kilometres I amused myself with thoughts of the free lunch we’d been offered and the chance to watch the likes of Dan and Jack huff and puff over the line (they’d still not passed me). Sadly I must’ve been scalped while chewing my stem as the Garmin bus was about to leave, so I stuffed my face with pasta and tried to empty the vats of squash single-handedly. A not too shoddy three-hour ride, but it felt a lot slower due to the rate at which others, including two tandems, passed me.